Today is my friend Sue's 70th birthday party and yes, she and her husband of 87 are catering it themselves. There promises to be the most amazing feast of coronation chicken, cooked ham, poached salmon, salads, mirangues, cream, strawberries and loads and loads of booze. Not tea-total, not Sue and David! People are coming from far and wide and one of the best things to accompany a party where the ages range from 90 years-9 months are bread rolls. Light and airy for those (of any age) without teeth; hearty and dense for those with a taste for things they need to chew, and something surprising that people may have not tried before. Shaping makes the otherwise dull, round roll interesting and seeds make them beautiful. Easy to make, quick to bake, these are perfect for a party, or any time. The top tip is to make the dough the night before and let it rise in the fridge. Then you can pull it out, shape them easily (cold dough is easier to shape), let them rise again for a couple of hours while you get ready for the day and then bake them. Totally stress free. See the recipes below! Put the flour in a bowl and make a well. Spoon in the yeast and add 100 g of warm water. Have a coffee and wait 15 minutes. Add the rest of the water and the salt and knead well for 10-15 minutes, until the dough is elasticy and stretchy. Pop it back in the bowl, cover it, and let it rise for 1-2 hours or until is has doubled in size. Alternatively put it in the fridge over night. Pull the dough out of the bowl and divide it into equal pieces of about 75 grams. Roll these into tight little balls and put them on a baking tray that you have lined with parchment. Space them about 1 inch apart. Cover with a cloth and let rise again for about 1 hour. Spray with water and sprinkle with seeds. Bake in a preheated 230 degree celcius oven for 15 minutes or so. If you tap the bottoms of the rolls they will sound hollow. Cool completely if you can! 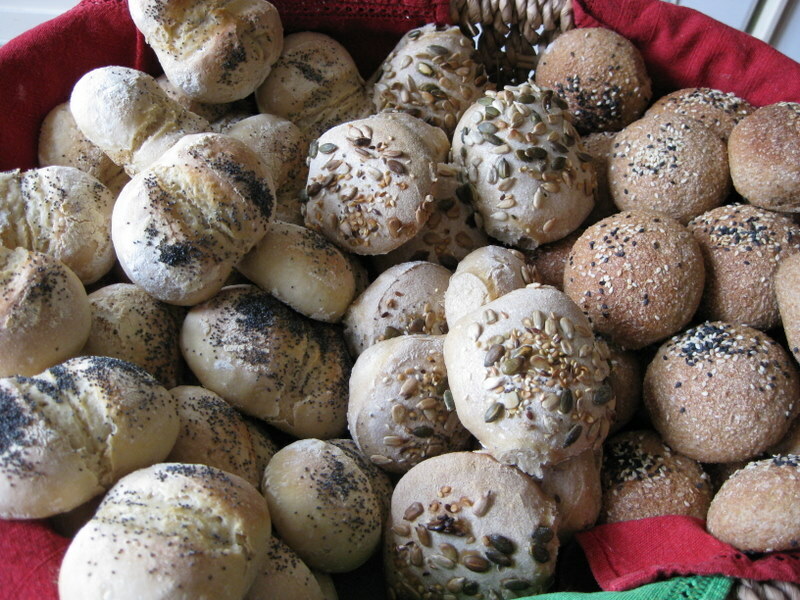 Recipe for white bread rolls - shaped like, well, little bums! Pull the dough out of the bowl and divide it into equal pieces of about 75 grams. Roll these into tight little balls and put them on a baking tray that you have lined with parchment. Space them about 2 inches apart. Take a chop stick (or a thin handle of a spoon) and push it down, legthwise, into each bun almost to the bottom. Then turn each bun over. Cover with a cloth and let rise again for about 1 hour. Turn the buns up again and gently re-press them with the chopstick again if the indentation has completely disappeared. Spray with water and sprinkle with seeds. Bake in a preheated 230 degree celcius oven for 15 minutes or so. If you tap the bottoms of the rolls they will sound hollow. Cool completely if you can! Put all of the ingredients in a bowl and knead well for 15 minutes. Put the dough back in the bowl and let rest for 2 hours or over night in the fridge. Pull it out of the bowl and divide the dough into two. Take each piece and form them into a firm sausage, about 5 cm in diameter. Roll the sausage in flour and have a dish of mixed seeds handy. Cut the sausage into slices about 2 cm thick. Dip one end in the flour on the table and the other end in the dish of seeds. Place each slice on a baking tray that you have lined with parchment. Cover and let rise for 2-4 hours or until they are visibly bigger. They won't double in size, but they will grow significantly. Pre head the oven to 250 degrees (or as hot as you can get it). Bake the buns for 12-15 minutes. The seeds will go nice and brown. Let cool if you can. If you would like to speed up this whole process, use the refreshed rye sourdough but add 5 g or so of yeast to the mix. Click here for more recipes and click here to come and learn to bake bread or buy a gift voucher for someone you love. I really want to make sourdough rolls for Thanksgiving next week, but I only have a wheat starter right now. Would simply adjusting the water to account for the different hydration of the starter be sufficient to use in the recipe above? According to my math, I would need to include an additional 40-45 g of water for the same hydration in the dough. it's not that simple, I am afraid as wheat and rye starters behave completely differently. I would follow a tried and tested recipe for wheat sourdough bread - one in which you know the "feel" of the dough. Substitute about 1/5 of the wheat flour with rye flour and up the water content to get to the "normal" hydration. I hope that makes sense? Thanks! I've been having good luck with the basic wheat loaf I found on the site (300g starter, 500g flour, 300g water, 13g salt), so maybe I'll try it with that one. Plus it makes the math easy if I replace 1/5 of the flour!